Added by Indo American News on November 10, 2017. HOUSTON: “Creativity has no pretense” and when it is straight from the heart, it can work wonders as was seen at Berry Center on Saturday, October 28, when Moksh Community Arts presented ‘Dil Se Naach – ‘Band Baaja Baraat’ Directed & Choreographed by Houston’s own Bollywood Maestro Mahesh Mahbubani and the exceptionally talented crew of Naach Houston: Anita Vyas, Shah Ahmed, Zohair Alam, Prita Kapoor and Twinkle Khanna while Arif Memon, the Light Designer created a magical space with every dance act. Spread over 4 acts, Dil Se Naach – Band Baaja Baraat was a celebration of life. 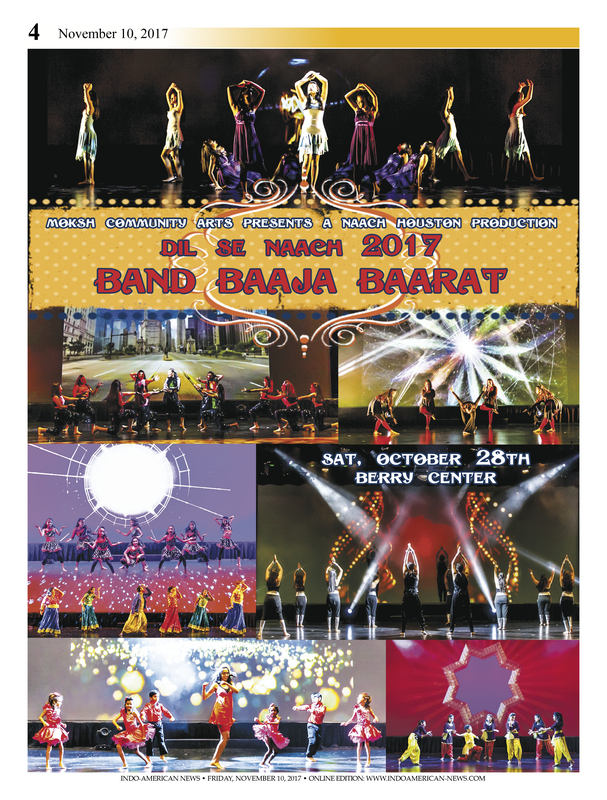 The show opened to a sold out audience at the Berry Center Auditorium with a revived retro “Jaanu Meri Jaan” followed by the visually appealing titles. All the four acts featured the Performance team interspersed by the student team, displaying the amazing homegrown talent that Mahesh Mahbubani has cultivated in the last decade. “Its all about influencing lives by the positive power of movement & dance”, says Mahesh about Naach Houston. Act 1 – “Chhaya Geet” (named after the one of the first ‘songs only’ television program that started in India in the 1980’s), featured songs from different eras of Bollywood including Tamma Tamma, Udi Udi Jaai, Mercy and a remix of Mohra fame ‘tu cheez badi hai mast mast’ that had the audience in sync with everyone on stage. Act 2 titled around the world, went beyond Bollywood and included current favorites “Shape of You”, “50 Cents” and “Touch me” & Galti se Mistake, concluded with a session of Bombay Jam mixes. Naach Houston is the only dance studio in Texas offering ‘Bombay Jam’ – a Bollywood based fitness program that mixes ‘masti’ and fitness, approved by AAFA (American Association of Fitness & Aerobics). The Student show case in Act 2 opened with the amazing seniors accompanied by Mahesh to the latest song Sweety tera Drama followed by “Ishq Bina”, “Dishoom” and “Swalla” performed by the junior student team to a thunderous applause from audiences. The next act was crème de la crème of the evening with contemporary dances in ‘Sufianna’ inspired by Sufi Poems. Dances & visuals to songs such as “Channa Mere aa”, “Chaar Kadam”, and “Baarish” were a treat to the eye. Memories of these dances will remain imprinted with the spectators for a long time. The student showcase in this act included “Haanikarak Baapu” and “Ae Dil hai Mushkil”. Act 4, Band Baaja Baraat was a true celebration of life as student show case and the Naach performance team came together to bring some brilliantly choreographed songs to life including Kehna hi kya from the movie Bombay, “Prem Ratan Dhan”, “Radha on the Dance floor” and “London thumakda”. Before the much-awaited finale, Dr. Manish Rungta – the president of Moksh Community Art came on stage to introduce Moksh and announce creative arts awards acknowledging the contribution of three prominent Houston personalities involved deeply in promoting arts in the city – Navin Mediwala for Photography & Visual Arts, Arif Memon for stage lighting design and Dr. Anita Vyas for website design, movement & dance. Malay Vyas, the Vice President of Moksh spoke on how Moksh plans to support creative arts across all platforms, nationalities and backgrounds in our community. Dr. Rungta thanked all the sponsors, audience and the parents for supporting Moksh Community Arts and Naach Houston. The dancers then took stage for the finale featuring Hawaa Hawaa and Badri Ki Dulhania bringing the house down. The show was sponsored by The Rungta Foundation, Neel A Patel CPA, Vasu M Bommanna M.D., Shelina Malick , and Media sponsors Indo-American News. Photographed by Navin Mediwala and Videography by Shivendra Singh.